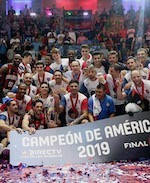 San Lorenzo grabbed the second straight win in Buenos Aires. They held off Hebraica to stay perfect in Group C. Gabriel Deck (199-F-95) netted 29 points to pace the winners. Hebraica enjoyed a 37:35 halftime lead. But San Lorenzo erupted for 47 points in the second half and rallied to the victory. Nicolas Aguirre (188-PG-88) accounted for 14 points and 9 assists in the win. Michael Hicks (196-F-76, college: Texas A&M-CC) responded with 23 points and 7 rebounds for Hebraica. Capitanes de Arecibo opened win count in Group C. They rallied past Bucaneros for 1-1 record. Donte Greene (206-F-88, college: Syracuse) stepped up with 23 points to pace the Puerto Rican side. Capitanes used a 23:17 run in the second term to open a 6-point halftime lead. Bucaneros pulled within 3 points heading into the fourth quarter. But Arecibo dropped 25 points in the final stanza and got away with a tough win at the end. Denis Clemente (183-PG-86, college: Kansas St.) delivered 19 points for the winners. Donta Smith (201-SF-83, college: SE Illinois JC) responded with 17 points and 11 rebounds for Bucaneros.